Uncategorized Archives - Sukey Molloy! Listen to my interview with Mike Mason on Good Stuff Kids. 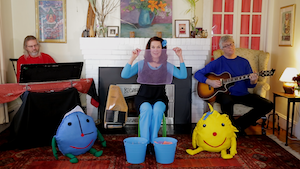 “Sukey Molloy puts a big smile on traditional favorites and mixes them with original songs, poetry, and a story for the release of her fifth album, Five Little Oysters! 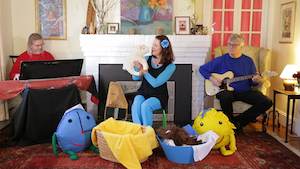 Listeners are invited into a personal, intimate world of familiar old time favorites as Molloy changes up the lyrics with lots of special effects, creative rhythmic nuances, and colorful percussive textures, and highlights educational, learning fun with counting, farm animals, and cozy family listening for children of all ages! 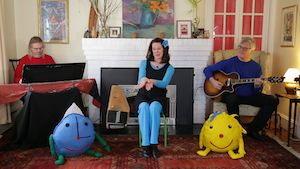 Sukey Talks To Kidskintha.com about her new CD “Five Little Oysters! Hi! 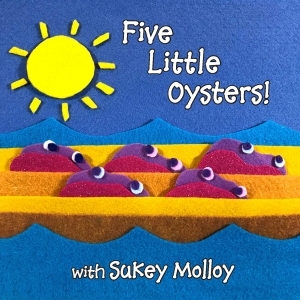 I’m delighted to announce the upcoming Oct. 5th release of my brand new album, Five Little Oysters! Co-produced with my long time friend and Grammy winning recording engineer Larry Alexander. Five Little Oysters features lots of old time traditional favorites along with original new tunes and story. 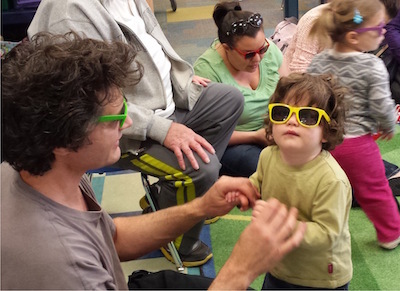 Here are some excerpts from an interview I gave with Megan Meehan at Kidskintha. Enjoy! You can click on the link HERE to see the full interview. Megan Meehan: What is unique and most exciting about your forthcoming album? MM: What inspires your songs and do you typically write lyrics or melodies first? 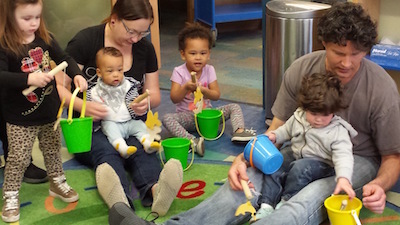 SM: What inspires my songs is being together with families and children, and learning what brings them into relation with each other, and the activities we engage in together, whether on stage or in a library or at a school. This is the highest compliment I could receive. In Mister Rogers’ acceptance speech for an award from PBS, he said that the six feet of space between the television screen, and the child viewing, is for him, ‘sacred’ – and this has remained the guiding principle in all my work. I have a little story to leave you with. My husband and I were at Colonial Williamsburg years back with our two sons, Jonathan, a baby, and James, 5. 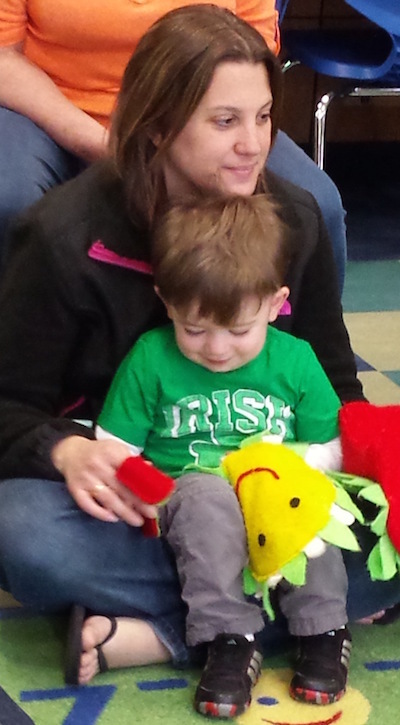 We were never a big television family, but James watched Mister Rogers faithfully and loved him. We were strolling along the village walkways, with James pretending to be a soldier, and we spotted a large carriage, drawn by four large horses. There was a camera crew both in front and behind, and when I pointed, James suddenly called out, ‘Mister Rogers!’ and started running full speed toward the scene. We ran behind him, and sure enough, there was Mister Rogers, sitting up in the front of the carriage, being filmed! When Mister Rogers saw this little five-year-old boy running toward the carriage, he stopped the crew, halted the horses, and opened his arms wide. James ran up the three carriage steps and right onto Mister Rogers’ lap. My husband and I watched as Mister Rogers asked him his name, spoke with him about ‘things’, and then after a bit, in the most natural and respectful way, told James it was time for him to continue on. They had a handshake, or a hug, I can’t remember which, then waved goodbye, and off Mister Rogers went, down the road in his horse drawn carriage, out of sight. It was deeply affirming to find that Mister Rogers was truly the same humble man we knew on screen, and to witness him give his love to our child. 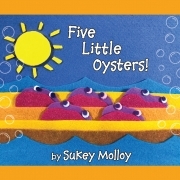 http://www.sukeymolloy.com/wp-content/uploads/2018/08/Five-Little-Oysters-Book-1.jpg 988 1200 brianpearl http://www.sukeymolloy.com/wp-content/uploads/2018/07/sukeynewheaderbrella.jpg brianpearl2018-09-27 20:30:512019-03-06 13:04:55Sukey Talks To Kidskintha.com about her new CD “Five Little Oysters! Sukey’s House! Vol. 2 now available! Guess what? I’ve officially released Sukey’s House! Volume 2 for streaming and digital download through Amazon.com. As with Volume 1, Sukey’s House! 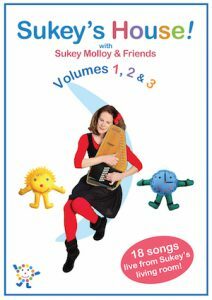 Volume 2 was filmed at my house with my band Sukey Molloy & Friends, along with favorite ‘Sukey’s Circle’ friends Sunny and Tick Tock. 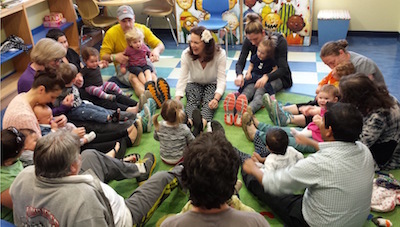 I hope you’ll join us in the warmth of my living room for music, movement activities and sing along fun the whole family can enjoy. As a special surprise, I’ve included here one of the song/videos for you to see. I thought your children would enjoy seeing Sunny & Tick Tock get ready for their late afternoon nap. Sukey’s House! Volume 2 includes the six titles: Open Shut Them, Riding on a Ferry, Be Happy Don’t Worry, Three Little Ducks, Down in the Meadow, and Night is Falling. Let me know which ones you like the best! They are available exclusively for streaming and digital download on Amazon.com. http://www.sukeymolloy.com/wp-content/uploads/2018/07/sukeynewheaderbrella.jpg 0 0 brianpearl http://www.sukeymolloy.com/wp-content/uploads/2018/07/sukeynewheaderbrella.jpg brianpearl2016-10-07 15:11:082016-10-14 13:38:02Sukey’s House! Vol. 2 now available! 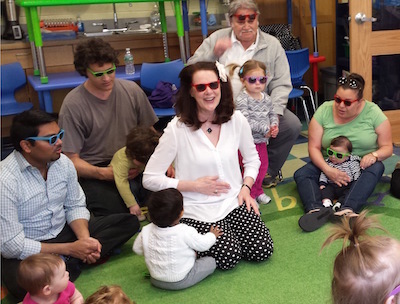 I’ve had a most amazing time at the Monroe Library this spring and thought you’d enjoy learning a bit about our time together. A picture says a thousand words! Many thanks to Melissa and Joy who took all the great photos, and who hosted the program. 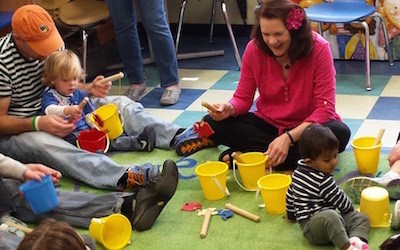 My Circle Time program includes songs, musical instruments, and movement activities for children age birth to 5. 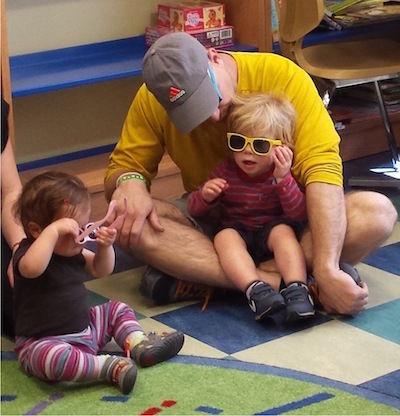 In Monroe we created a ‘family style’ series for children birth to age 3. Something for everyone! I find that singing Hello is always a great way to begin making new friends, and I like to use hand puppets for everyone to sing and wave with while we greet one another. 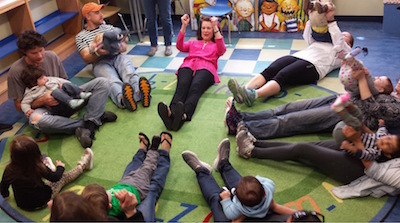 …while creating a circle of friends. 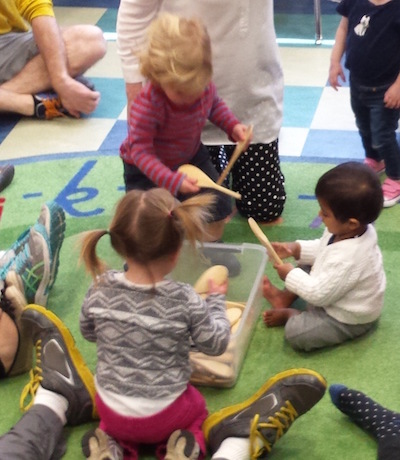 Maraca play is another great circle time activity. 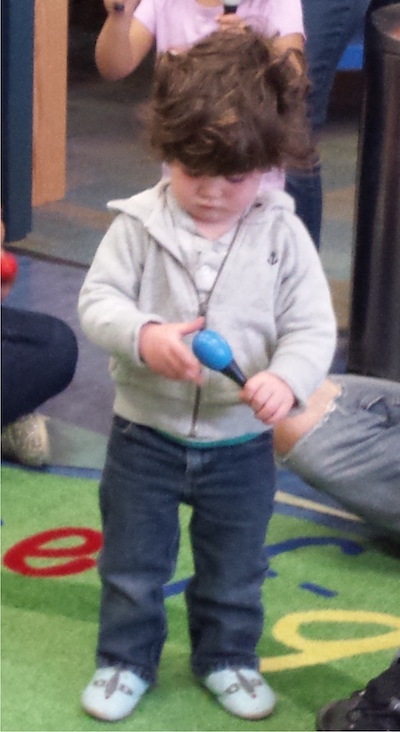 Maracas are fun to touch, chew, shake and tap, and great accompaniment for all kinds of songs. 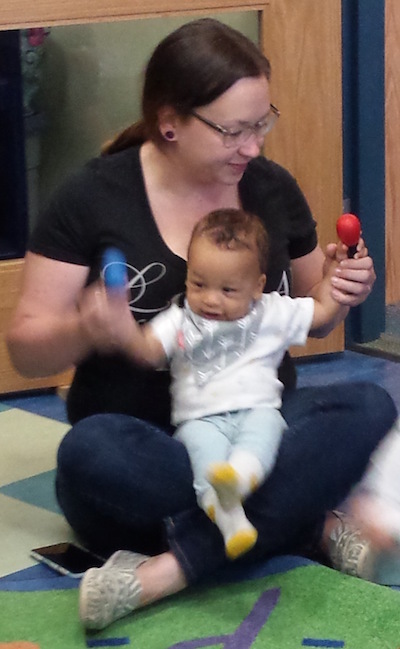 Participating in rhythmic motion is great stimulation for the developing brain! We sang Here We Go Up, and changed the lyrics to ‘here we go shake, shake, shake’. 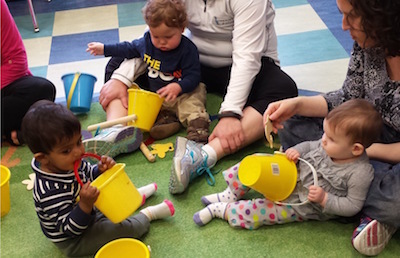 And playing with pails is an all time favorite activity. 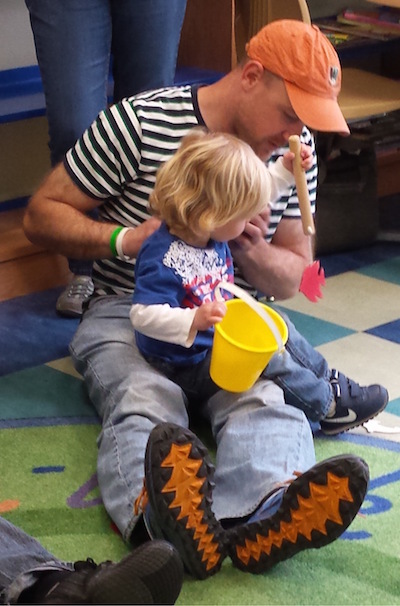 In our song/play we added fish and fishing poles, and practiced catching and releasing fish in and out of the pail. 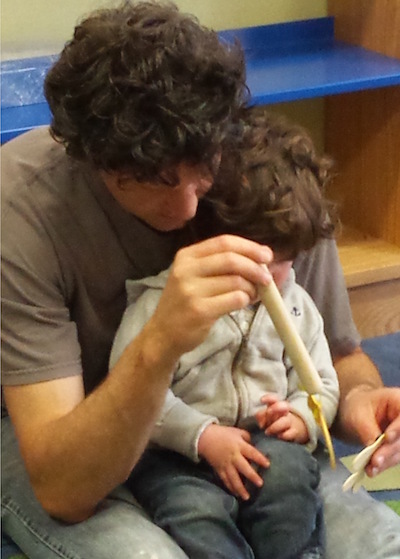 This is great fun, and good for fine motor skills, eye hand coordination, and creative imagination. And singing Row Row Row Your Boat is always a wonderful favorite. 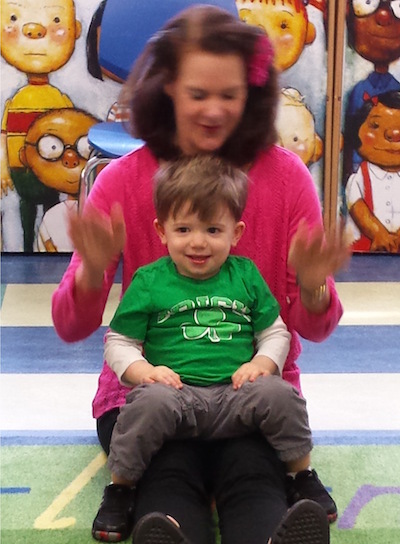 Rocking motion is great for vestibular stimulation and helps to develop balance. It’s fun to try it going both fast and slow. Then our boat capsized, and upside down we went! 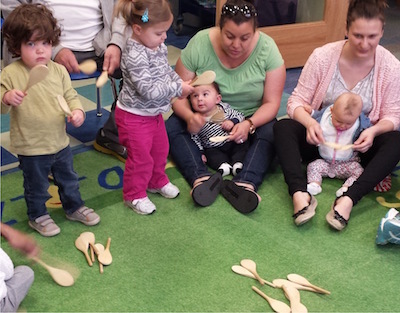 Playing with musical spoons is another activity that’s great for learning fun. 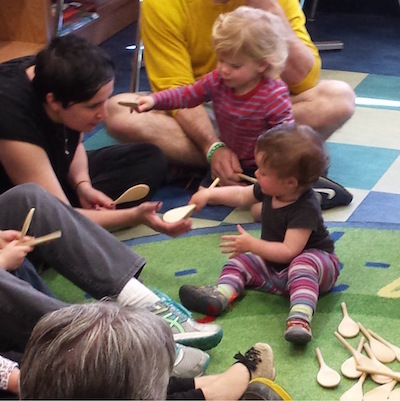 There are so many things to do with wooden spoons! Here we’re getting ready to sing If I Had Hands (Spoons). We just changed up the lyrics! 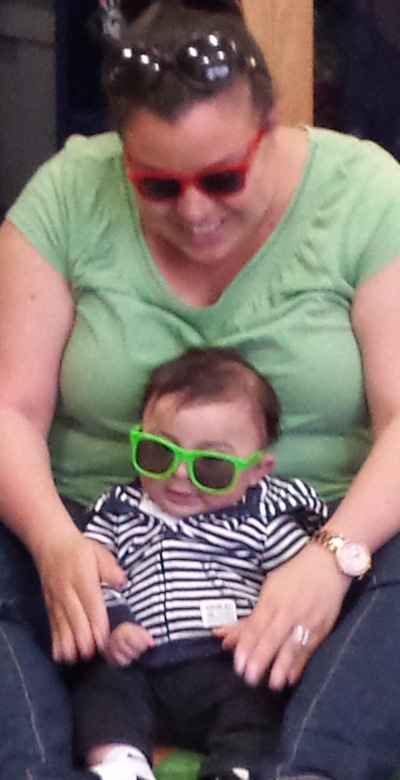 And playing with sunglasses, now that’s fun. 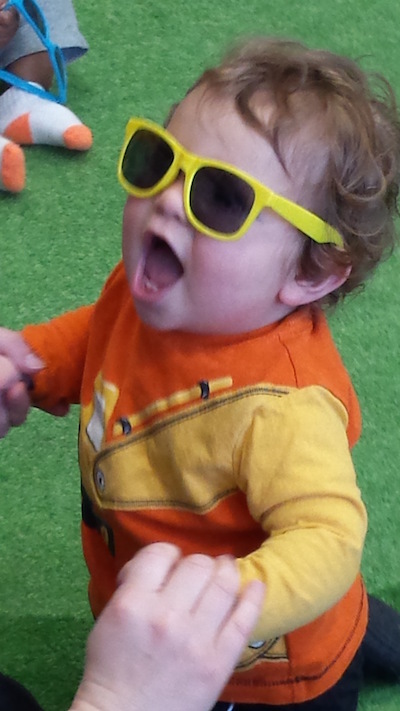 Look at me singing These Are My Eyes! You can buy my CDs HERE. http://www.sukeymolloy.com/wp-content/uploads/2018/07/sukeynewheaderbrella.jpg 0 0 brianpearl http://www.sukeymolloy.com/wp-content/uploads/2018/07/sukeynewheaderbrella.jpg brianpearl2016-05-09 22:09:162016-05-10 00:31:33Circle Time in Spring! It’s the same with learning how to play ball. There are definite steps along the way. 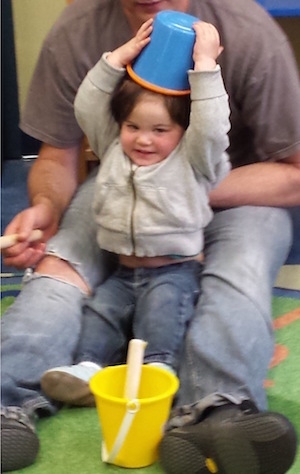 First the child learns how to hold the ball, then to pat it, roll it, bounce it, toss it, pass it to a parent, and eventually to toss it through a hoop! Each new milestone leads to the next stage of learning and creates an invitation for more experimentation. I hope you find this video clip interesting. It’s from a developmental movement workshop I gave in NJ, and a clip from a class on ball-play. 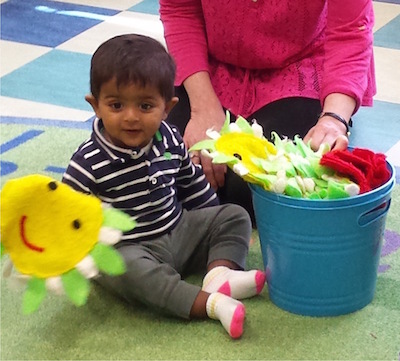 We’re exploring bringing ‘skill based learning’ in a fun and developmentally appropriate way. Download Pat the Ball (Circle Songs, 2005) for free by clicking on this link. Pat the ball to day. I love to look up at the stars in the nighttime sky. Don’t you? I love the special feeling of awe and wonder that comes when gazing at the little twinkling beams of light. When I recorded Twinkle Twinkle on my I Like to Sing album, I discovered that the lyrics are from an early 19th-century English poem by Jane Taylor called, “The Star”. It was originally sung to the tune of a French melody called, “Ah! Vous dirai-je, maman”, and was published in 1761. The song was later arranged by several composers, including Wolfgang Mozart. In my Sukey’s Circle! videos (Vols. 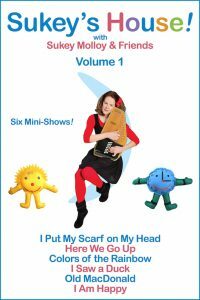 2 & 3) I dance with my Sunshine Family friend, ‘Twinkle Little Star’, who I created in felt to share with children and audiences in concert. 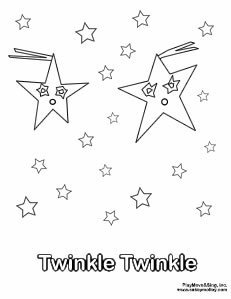 I hope you and your children will download and color my new Twinkle Twinkle coloring page! Just click here to download, or click on the image below. 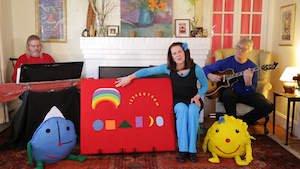 You can also download the Twinkle Twinkle song on iTunes (on my I Like to Sing CD), and order my Sukey’s Circle! 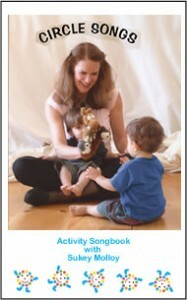 videos on Amazon, and at www.sukeymolloy.com. I hope you make a special wish with your children tonight under the nighttime sky. Where Does the River Go? is one of the very first felt animations I created, and the longer version can be seen on my Sukey’s Circle! Volume 2 DVD. 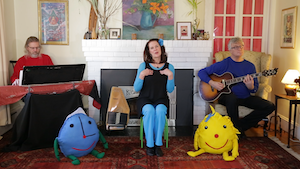 The video is set to a song I wrote while sitting next to a stream in Vermont with my son. As the water gently rushed by, carrying fish, twigs and leaves along with it, I couldn’t help but wonder where all the water was going? And as I looked up at the sky, with birds and clouds flying and floating by, I had the impression that the water and birds and clouds and fish were all ‘on their way home’. For the felt animation, as with the song, I wanted to re-create the feeling of gentleness and safety and wonder that came to me while sitting by the stream. And I wanted to convey that quality of reassurance and peacefulness with the children and families who would later on listen, and watch. I hope you enjoy the video, and I hope you’ll share my new coloring page (below) with your children at home! Click here to download, or click on the image below. 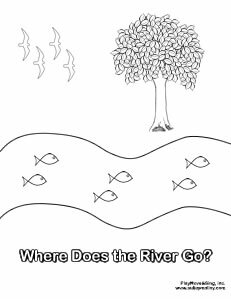 You can also download Where Does the River Go? (from my I Like to Sing album) on iTunes, and you can purchase all my Sukey’s Circle! videos on amazon.com and at www.sukeymolloy.com. http://www.sukeymolloy.com/wp-content/uploads/2018/07/sukeynewheaderbrella.jpg 0 0 brianpearl http://www.sukeymolloy.com/wp-content/uploads/2018/07/sukeynewheaderbrella.jpg brianpearl2015-06-17 15:41:582015-06-17 15:41:58Where Does the River Go?